ScriptCase has incorporated the concept of Object Oriented programming, using attributes, resources, methods and libraries. It is possible to create your own business rules in applications, and by using these concepts you can reap huge rewards in terms of better organization and improved development. The attributes are variables that has the global scope declared in the application. An attribute that can be referenced in all the methods and the application’s events. Attribute Name : This field allows to inform the attribute’s name, after typing the name just click on include. In case you want to update click on the attribute’s name (located on the buttons’ right side), do the necessary modifications and click on update. In case it is necessary to delete an attribute, it is necessary to do same process as the update, but when selecting the attribute, it is necessary to click on the delete button. The clear button, as the name suggests, it clears the list of all the attributes listed on the right. 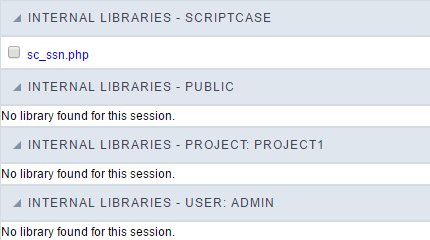 To use the internal libraries just select the correspondent ( Project Libraries for example). This process allows the methods existing in the library, to be visible in all the application’s Events and Methods. See how to manage the libraries by clicking here. 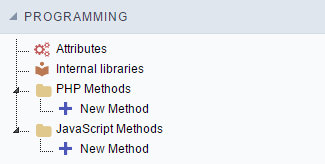 Methods are function or procedures declared by the developer, that helps when appling the routines. Using methods in the applications allows to reuse your code throughout the application, optimizing the development experience. Define a name for the method and click on Create. Like the image below. Name : Type in the variable’s name. Type : Selecting the type of variables: For Value or For Refference. 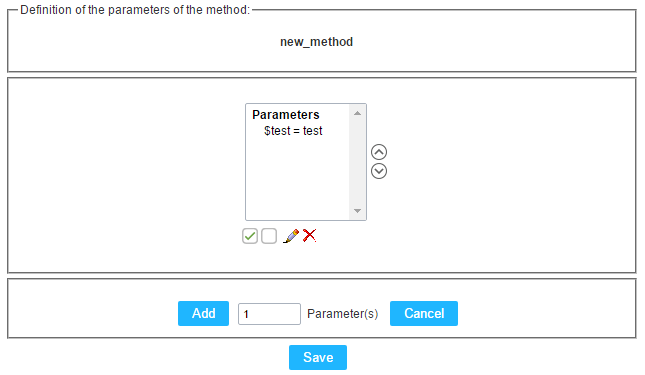 Value Standard : The parameter’s value used to initialize when calling the method. Refferences allows to create a second name for a variable that you can use to read and modify the variable’s original information. : Checking all the parameters in the parameter list. : Unchecking all the parameters in the parameter list. : Edit the selected parameter of the list. : Deletes the selected variable of the list.